A beautiful grass with narrow green leaves and graceful fair-haired plumes of flowers in the summer. Plants grow to a height of 40-60cm and are useful for borders, Mediterranean gardens, edging and pots. These grasses are great for bringing movement into the garden. 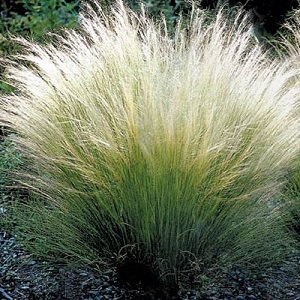 Mexican Feather Grass grows best in full sun to part shade and medium to light soils. It is low maintenance once established and tolerates drought once established. Plants tolerate exposed gardens. Pack of approx 100 clean seeds (small seeds). Sow in spring or autumn. Sow by March for first year flowers. Sowing instructions and colour photo are printed on the packet. Sow on the surface of a tray of compost. Press the seeds gently into the compost or cover the seeds very lightly with compost or vermiculite. Keep at around 20°C and seedlings emerge in 2-4 weeks. If there is no germination within 4 weeks, move the tray to a fridge for 2-4 weeks and then back into the warmth for germination. Pot on and grow until the plants are ready to plant out after the last frost. Protect autumn sowings over winter in a coldframe or greenhouse. Sow by March for first year flowers. Plants die back in the winter after flowering. Clear away the dead material in early spring before the plant starts growing again in spring. Mature plants can be divided in spring.